Italians have perfected the art of food and wine pairing, with each region’s signature dishes geared to what’s grown locally. Today, their unique food products are defined and guaranteed by a Protected Designation of Origin (PDO), a set of regulations that keep foodstuffs and wines true to their regional roots. Quality is protected through traditional methods of production. What we often experience here in the US is an American version of classic Italian products, best illustrated with the world-famous Parmigiano Reggiano cheese. Genny Nevoso, Executive Director for the IACCW, pointed out that many American versions of grated Parmesan cheese contain cellulose to keep it from sticking together. Traditional Parmigiano Reggiano is made from all-natural ingredients, and so strictly supervised, it’s journey from cow to wheel is documented and guaranteed. This dedication to authenticity is what propels Italy’s cuisine to the highest level. Steeped in history, Italy’s rich tapestry of regional cuisine and intriguing wines form a magical bond of sensory delights that is the beating heart of Italian culture. In ancient times, Italy was known as Enotria, the “land of wine”. Greeks brought viticulture to Sicily and southern Italy over 3,000 years ago, and the rise of the Roman Empire expanded the art of winemaking throughout the sun-drenched, mountainous Italian peninsula and beyond. Today, it is viticultural heaven, with over 3,000 grape varieties, from 20 different regions, with a rich legacy of wine that has been perfected through the millennia, and US wine consumers are just beginning to explore these wines. The IACCW introduced the wines of Veneto Hills and Vino Direct at the luncheon. Veneto Hills is a family-owned winery, situated in the hills above Venice, that excels in the production of high quality Prosecco. Sustainably farmed and produced by the Zago-Gasparini family, their label, Tenuta 2Castelli, offers four Prosecco Superiore wines from the highest quality region, Conegliano Valdobbiadene. Nicola Serragiotto of Veneto Hills brought two examples, an Extra Dry and a Brut Prosecco. The Tenuta 2Castelli Conegliano Valdobbiadene Superiore Extra Dry DOC, contrary to what you might think from extra dry on the label, had a perception of sweetness, yet still was a dry wine. Golden in color, its tiny bubbles delivered refreshing acidity with a bit of heft from the fuller body. Even though it started a bit sweeter, it finished delightfully dry. 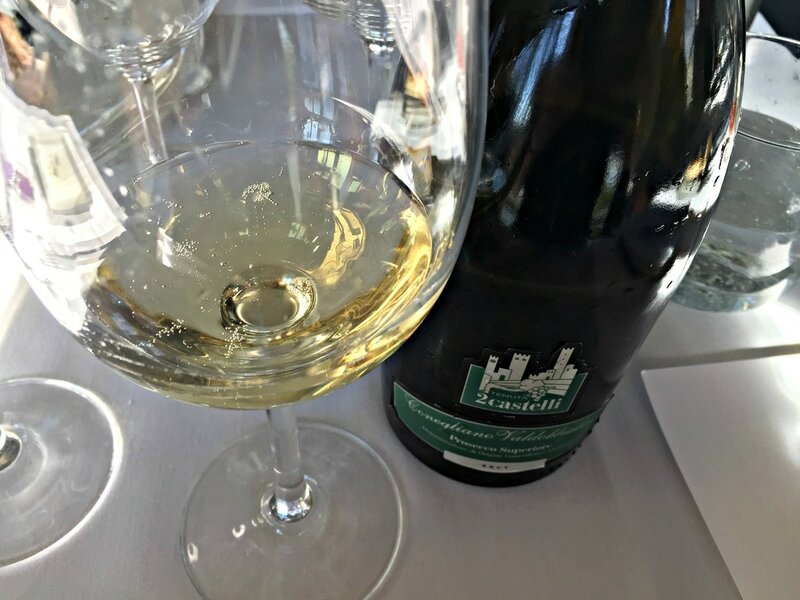 The Tenuta 2Castelli Conegliano Valdobbiadene Superiore Brut DOCG was dry and fresh, but richer in taste and texture than many other Prosecco wines. These are some of the best Prosecco I’ve tasted recently, capturing the essence of the Veneto, redolent of golden apple and pear, fragrant with white flowers and notes of citrus. As the tasting menu began, Franciacorta, an Italian sparkling wine made in the style of Champagne, was poured. Paolo Cressi of Vino Direct represents La Montina, a winery located in the lake country of Lombardia. They specialize in Franciacorta, whose different incarnations are made from Chardonnay and Pinot Noir, imparting an elegance to the wines. 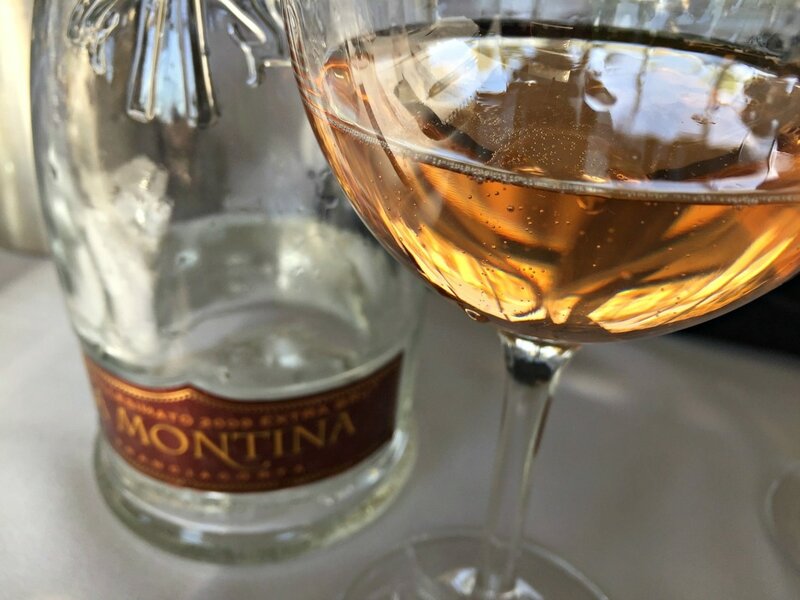 The La Montina Franciacorta Satèn is 100% Chardonnay, with extended lees aging (35 months) that gives character and texture to this silky smooth wine. Paired with the first course, a Salmon and Albacore Tartare with dried cranberries, on a bed of mashed avocado, dressed with a pomegranate-mustard vinaigrette, the Satèn’s bubbles really set off the freshness of the dish. The La Montina Franciacorta Rosé Millesimato 2009 Extra Brut, 85% Pinot Noir and 15% Chardonnay, was stunning. The winemaking included two days of skin contact and 40 months of lees aging, yielding an elegant, copper-colored wine. Paired with a Winter Green Flatbread, a base of Burrata topped with Endive, Spinach, Frisée, and dressed with a basil vinaigrette, the soft, wild berry notes of the wine pulled together the bitterness of the greens atop the lusciousness of the cheese. Paolo of Vino Direct also brought red wines from another producer, Ugo Lequio of Piemonte. The Ugo Lequio Barbera D’Alba Vigna Gallina DOC 2013 was smooth and ripe, balanced in its red fruit and cocoa notes, particularly good with food. Paired with Lamb Lollies atop Pepperjack Polenta topped with Brussels Sprouts, both the food and the wine increased in their flavor and fragrance, so delicious! The outstanding Ugo Lequio Barbaresco Gallina DOCG 2011, 100% Nebbiolo, was dense and rich, complex in its raspberry fruit, rose petal, tar, leather, woodsmoke and forest floor profile, truly beautiful for such a young Nebbiolo wine. Barbaresco is considered the feminine style of Nebbiolo, known as the “Queen”, compared to Barolo, which is the masculine “King” of Piemonte Nebbiolo. This was paired with Oxtail Bucatini with Braised Fennel, Arugula, and Parmigiano, the oxtails were braised for seven hours, a depth of flavor that matched the wine. This combination revealed the beauty of winter food and wine, so aptly embraced by the Italians, bewitching in its aromatics and depth of flavor. Bravo Chef David and Ugo Lequio! Fabian Rodriguez revels in the art of Italian living, la dolce vita! A different twist on the dessert course, Limoncello was served alongside a Lemon Tart with Toasted Meringue, Shortbread Crumble and Raspberry Coulis, intensifying the very lemony finale to a fabulous luncheon, thanks to Cafe del Rey and their staff. While everyone loves Italian food and wine, Italians have perfected the art of living well, La Dolce Vita! The Italy-America Chamber of Commerce West strives to bring authenticity to Southern California’s Italian experiences. 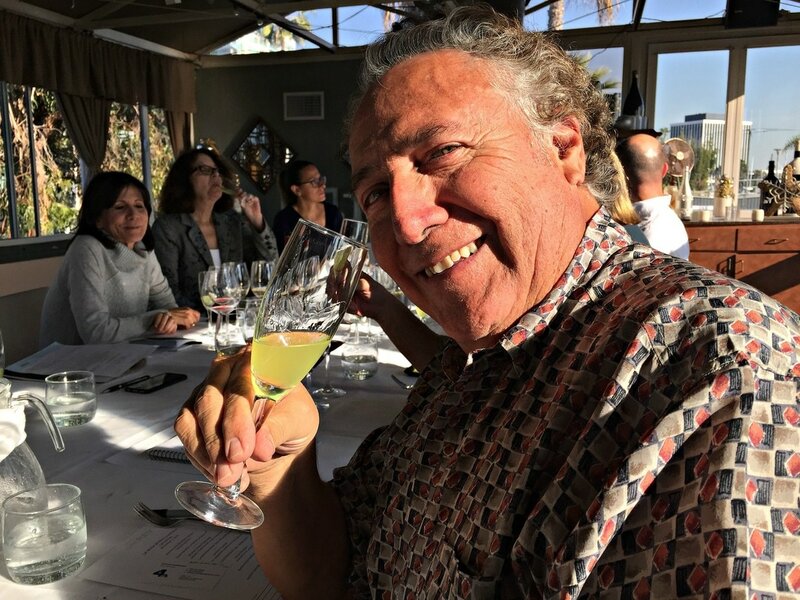 Through its many events and monthly wine tastings, the IACCW provides a great opportunity for Angelenos to embrace the art of Italian living!